This is a cute little studio cabin close to the lake and all of the Wallowa Lake activities with its own private lawn and parking. It has nice mountain views from deck where you can sit out and enjoy the sun and view or have a barbecue with the charcoal BBQ. It has its own lawn area and picnic table for those nice summer afternoons. It is a small, one bedroom Wallowa Lake cabin with a kitchenette and a bathroom with a shower (similar to cabin #1). This cabin is in a nice location that is within walking distance to the river and the lake, plus all of the Wallowa Lake activities like bumper boats, an arcade, restaurants, miniature golf, gift shops, and much more! 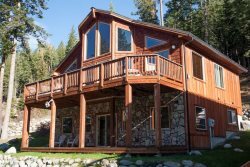 It is a cozy little cabin that is perfect for couples to relax in and enjoy all the wonderful things that Wallowa Lake offers. Cabin Size: 300 Sqr. Ft.